Glycosylation is a post-translational modification, in which a carbohydrate is covalently added to protein. This modification serves a multiple crucial roles in cell biology, including cell recognition, signaling transduction, etc. However, glycosylation has a feature of high structural complexity, which increases the difficulty of analysis of glycoproteins. Although it has been predicted that about 50 percent proteins are glycosylated, so far, only 10 percent glycoproteins have been identified. 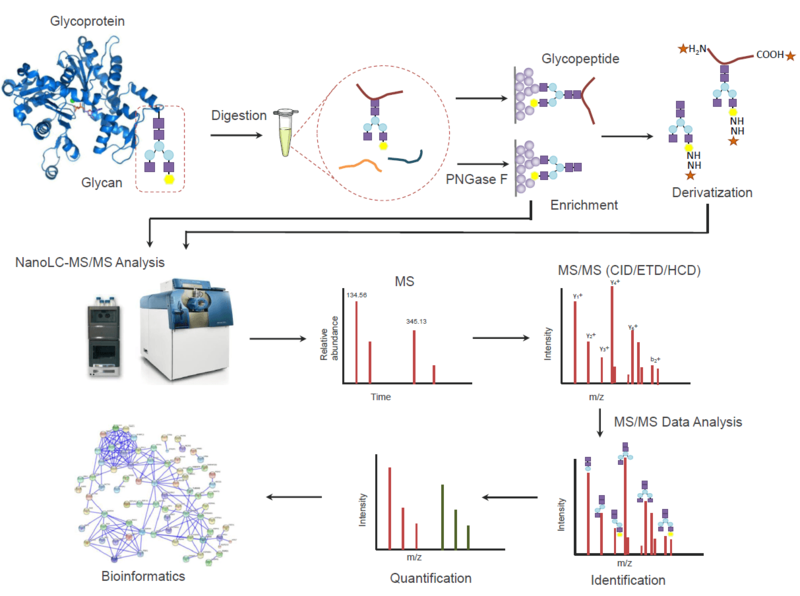 MtoZ Biolabs utilizes the HCD/ETD mode of Orbitrap Fusion mass spectrometry for glycoprotein analysis. Coupled with Byonic software, we can accurately analyze N- and O-linked glycosylation sites, and the corresponding glycogens. MtoZ Biolabs has also developed a specialized platform, equipped with Q Exactive HF (Thermo Fisher), Orbitrap Fusion, Orbitrap Fusion Lumos mass spectrometers, coupled with Nano-LC for glycoproteomics identification and quantification service. To better solve your research problems, we offer an all-inclusive service, including protein purification, digestion, peptide labeling and enrichment, LC-MS/MS analysis, data analysis and bioinformatics analysis. All you need to do is to tell us your project objective, and send us your cell/protein samples, and we will complete all the following experiments. *Note: We will perform testing experiment before we start official experiments. To ensure the most cost-effective and accurate analysis is provided, only qualified samples will proceed to the official analysis.